Bagshelf is a modular shelving system whose "shelf" elements consist of individual bags – that is, baglike sleeves that can be removed and used separately. What makes these bags so special is their material. They are made from a contour-cut magnetic foil, which means their cut is very precise but relatively free. The only limits to the dimensions are set by the weight of the finished bags or their intended capacity. 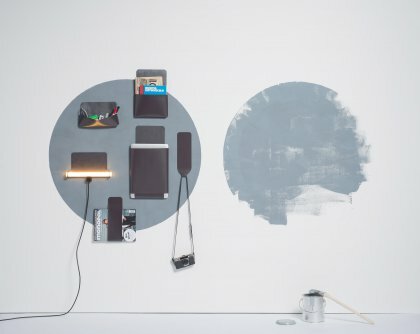 However, the bags only begin to form the actual shelf once they have been fixed to an area prepped with magnetic paint – where, once again, the definition of "wall unit" knows no bounds, at least in terms of space.